This Egypto-Roman leg probably comes from a stool. It was purchased from W. M. Flinders Petrie in 1891 with a group of ancient Egyptian objects, and appears to have come from Kom-Ioushim or Rubaiyat, north-east of the Fayûm, Middle Egypt. An indentation on the underside of the leg marks where the leg was held on the spindle of a pole lathe, for turning. The art of wood turning became widely practiced in Egypt during the Greco-Roman Period (ca. 332 BC-641 AD). Ball, spool, and vase profiles were turned on light, vertical lathes to produce legs for stools, chairs, beds or couch legs, which are often finished with bell-shaped feet. 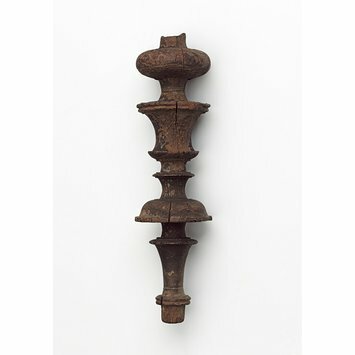 The complex baluster profiles on this leg indicate that it was produced using a heavier, horizontally mounted pole lathe which was developed during the Roman Period (ca. 30 BC-395 AD). Stool leg turned from a single piece of wood (not yet identified). Its profile is made up of a series of turnings, consisting, from the top down, of a squashed bulb shape, a large tapering reel, a smaller reel, a convex cap, and a longer tapering reel terminating in a plain foot. Underneath the foot there is a lathe mark. There are traces of paint, including, near the top, a green (atacamite, a traditional green pigment used since antiquity until modern times) and lower down off-white, but not enough paint survives to suggest what the original scheme was. Wood identification Acacia sp., acacia was carried out October 2012 by Dr Caroline Cartright, wood anatomist (scientist) at the British Museum. This leg probably came from a stool. The lathe mark on the bottom of the leg demonstrates that it was turned on a pole lathe. The complex baluster shape required a high level of skill. Petrie's finds appear to have come from Karanis (modern Kom Aushim) or Rubaiyat (modern Philadelphia/Kom el-Kharaba el-Kebir), NE of Faiyum, Middle Egypt. Although wood turning in Egypt is considered to be a Greco-Roman (ca. 332 BC- 641 AD) development, there is the possibility that it was practiced much earlier. For example, evidence of turning can be found on a pair of early New Kingdom (ca. 1550-1070 BC) stools in the British Museum, both of which are symmetrical in profile and have clear pivot holes on the bottom of their feet. However, the assumption that wood turning was practiced in the New Kingdom is still being investigated by scholars. is being rotated back and forth by one man with a length of rope, while the other man scrapes the wood away with a chisel. The scraping, accomplished by Egyptian turners using flat-blade scrapers or angled skew chisels, was done on both the forward and reverse motion of the work, resulting in chatter and score marks being left on the wood. The art of wood turning, using the type of lathe illustrated in the tomb of Petosiris, became widely practiced in Egypt during the Greco-Roman Period. Many intricately turned furniture legs date to this period; they are elegantly worked into ball, spool, and vase profiles, to produce objects such as stool, chair, bed, or couch legs, often finished with bell-shaped feet. This type of turned leg can be seen painted on Greek vases and on Roman wall frescos, indicating the desirability of this type of furniture in the Greco-Roman period. Although prevalent, this type of light, vertical lathe would not have been able to produce the heavier, more intricately turned legs of the Roman period (ca. 30 BC-395 AD). 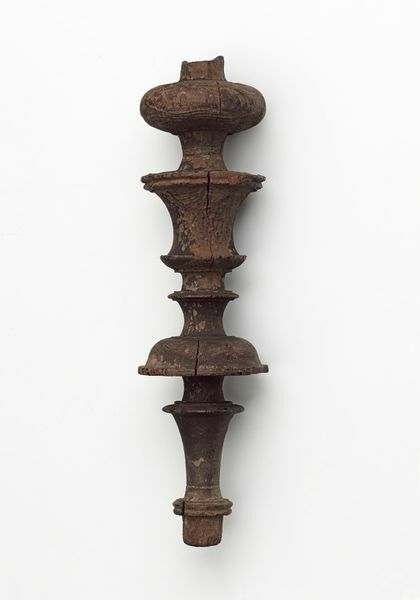 Horizontally mounted pole lathes had to be developed to produce the more complex profile seen in legs such as 536-1891 at the V&A. Wood turning was widely practised in Egypt at this period, and possibly much earlier. Many intricately turned legs from stools, chairs, beds and couches have survived in the dry soils of burial sites. The complex and confident profiles of this single-piece leg were turned on a horizontal pole lathe.